Let’s get right down to brass tacks here - Yin Yoga is probably my favorite asana practice. Something about truly relaxing deeply into long-held poses and just slowing down is like crack to me. And yet, I’m often surprised at how little-known this practice tends to be. It’s relegated to a few weekly classes at some (but not all) studios. And I often have to give a detailed explanation of just what it is. That is just a damn shame as far as I’m concerned! 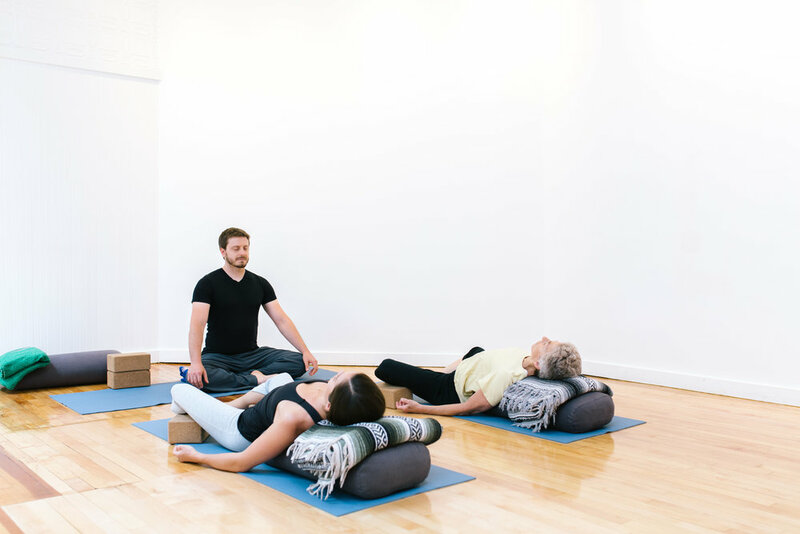 This post will serve to demystify the practice, clarify any questions, and hopefully by the end you’ll be ready to sign up for your first Yin class yourself. In Yin Yoga we use passive holds of 3-5 minutes to access the deepest tissues of the body. There is no rushing physically or mentally, and the body is completely relaxed. You’re encouraged to pay attention to each moment, listen to the sensations in the body, and work gradually through each pose. Since the technical practice is quite simple, this also opens up an opportunity to learn the principles of mindfulness. But really, that is just a basic synopsis that barely scratches the surface of what this practice can accomplish. There is much more to it than that. Yin Yoga is all about listening to your body and working with it rather than against it. Often our yoga practice becomes a battle against our own bodies in order to reach our deepest edge or do the strongest variation of the pose we have been offered. We see pictures on Instagram or Yoga Journal of super-yogis doing super-poses and we strive to recreate these results ourselves. But the reality is that one’s ability to do many of the most challenging Asanas may have more to do with their individual anatomy than simply with their amount of practice or dedication. The harsh truth is that for many of us, certain poses may never happen with any amount of practice - and that’s okay! This is also not meant to downplay stronger asanas nor the people who practices them. There is definitely a time and place for physically demanding asana, but it’s important to be realistic about one’s true limits. In Yin Yoga we embrace our own physical limitations rather than simply try to fight against them. We work with the body just as it is, and that in and of itself is an amazing thing. Each person will look quite different in each posture. There is no ‘perfect’ pose nor perfect alignment. In fact, even the same practitioner may approach each posture differently depending on how their body is feeling during any given practice. I even imagine that some alignment-minded teachers might look at some of the shapes that I allow in my classes with a look of fear or disgust. I welcome their criticism, because I know that bodies are not meant to be forced into perfect geometric shapes! There are infinite variations to each person and each pose. And what’s far more important than how we look is how we feel within each pose. As long as we are in a safe level of sensation, and we work cautiously and gradually, there is no ideal way to do any yoga asana. My pigeon will look completely different from yours, and that’s the way it should be. By working carefully with the body and relaxing our muscles, we are able to hold poses for far far longer than we can in a more active yoga class. Whereas five minute in downward dog is a testament of strength that would almost never be taught to a regular class, a five minute butterfly pose is an everyday occurrence in Yin practice. The difference is in the approach. Just like braces slowly work with teeth, Yin Yoga works slowly and passively with the denser layers of the body. The order of magnitude is different - braces may take months or years, whereas Yin postures typically last a few minutes, but the principle is the same. By working slowly and gently we can have a powerful effect on even the most sensitive tissues in the body. By relaxing the muscles, we go deeper. A vitally important, yet often-ignored part of our muscular-skeletal system is the network of connective tissue that holds it all together. This includes all of the fascia, tendons, ligaments, collagen, and other dense tissues that make a literal web throughout our bodies. Yin is one of the few practices that can safely focus on thesetissues with little risk of injury. Yes, other styles of practice can have this affect too, but Yin allows a far deeper level of attention to the connective web. I like to think of it as a completing our method of exercise. We use dynamic movements to build muscle mass, strength, and burn calories. We use slow, gentle holds to lengthen and strengthen the connective tissues of the body. Even experienced Yogis might be surprised at how much more complete one’s practice feels once they add in a regular Yin component. But for me, the real power of a Yin practice comes from how it helps to train the mind. Since we hold each pose for 3-5 minutes, each pose essentially becomes a very short meditation. For these few minutes we become still and we pay attention. The entire body becomes the meditation object. As we pay attention, we realize that there is a whole other level of experience that we are normally disconnected from. We may notice tiny sensations in the body. We feel pleasant aspects, unpleasant aspects. We notice the larger patterns of both the body and the mind. Sooner or later, (more often sooner) we will come up against a mental edge. We will feel challenged by the sensations of a posture, or maybe we’ll just get restless and want to fidget. It is in these moments where we can powerfully train ourselves to react differently. In daily life we usually avoid the unpleasant - we try to tailor our experience to be exactly as we would like it. In Yin, we confront what already is. The irony of course is that as we let go of our reactions, even otherwise challenging postures can take on a pleasant quality all their own. Yin Yoga can also supercharge the body to be prepared for traditional seated meditation. When the muscles and connective tissues are deeply relaxed it becomes much much easier to sit still for long periods of time. I notice that when I am neglecting my Yin practice I become very uncomfortable when I try to do seated meditation for any real length of time. When I am being consistent with my Yin practice, even long sits up to and hour or more become accessible. It all comes down to the lengthening of the deeper tissues of the body. This will have a noticeable effect when it comes time to sit still. So are you ready to give Yin Yoga a shot?? Let me know what you think in the comments below. Sign up to here to learn more about Rob's latest classes and more! Hi, I'm Rob! I teach Yoga and Meditation in D.C. Metro. You can learn a bit more about me here, in my bio. Also, check out my public class schedule and upcoming workshops to practice with me in person!